And it was another gorgeous day in Baton Rouge. We have been so blessed! It was a cool 49 this morning but perfect day. Now we have a beautiful sunset. 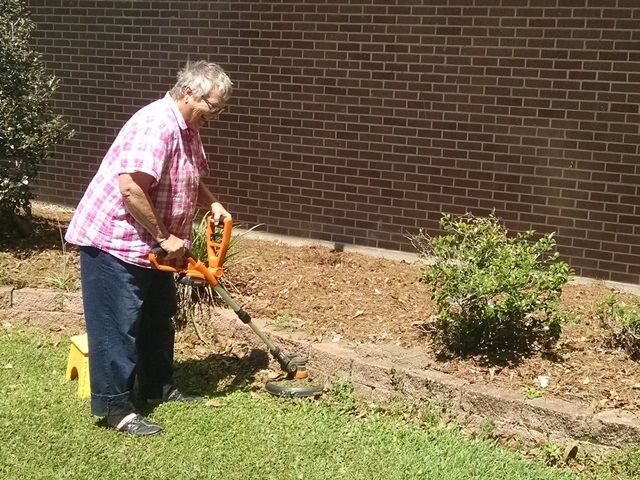 It wasn’t planned but we ended up working around the church this morning helping them spruce things up a little for Easter. Such a sweet congregation. There was weeding, and trimming and sweeping. Oh, I almost forgot. Pastor Dave asked us to take down the Lent sign. The banner portion was a breeze but then there were these 2x4s that seemed to reach to China. 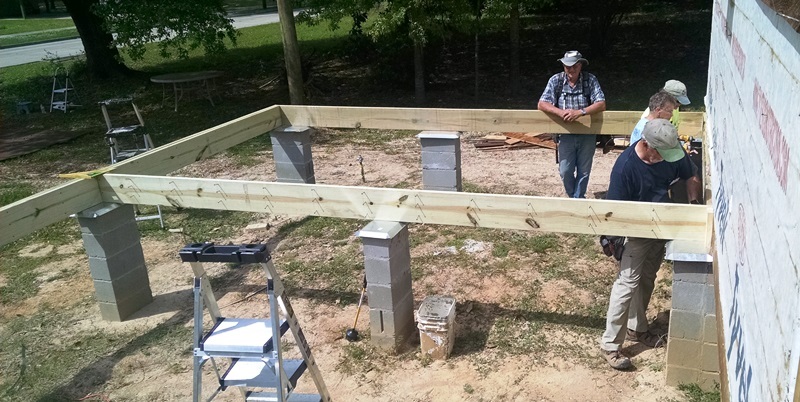 The two of us were out by be highway trying to get these four posts up and one of the members of the church across the street came over to helped us. He thought it would be easy with the shovel he brought along. We were all surprised with how much work it took even after digging around the posts. Anyway, with his help and a lot of laughter, we finally got them up. We sure did appreciate our good neighbor. It had been two days since we were last in Lowe’s so we decided to visit Home Depot today. Decided on a ladder we like but we will wait and pick it up after we get home since we already have two with us on this trip. (Thanks Mark. It will be just like yours.) Also picked up a new tool belt for Anne. 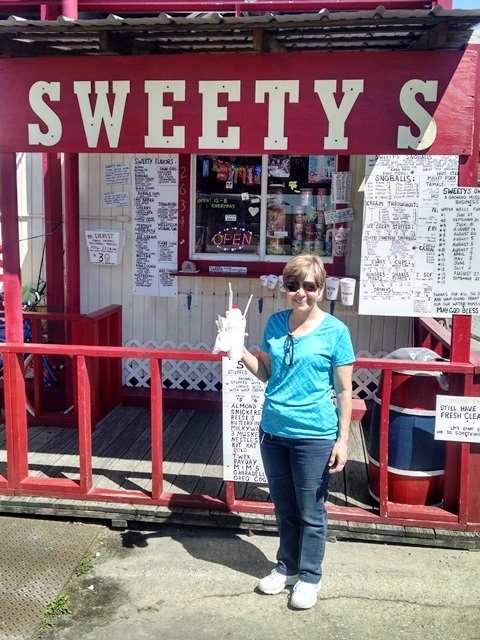 On the way home from Home Depot we stopped at Sweeties, a local ice cream and snow cone shop. The owner gives 20% of his sales plus all tips and contributions towards digging water wells in third world countries. 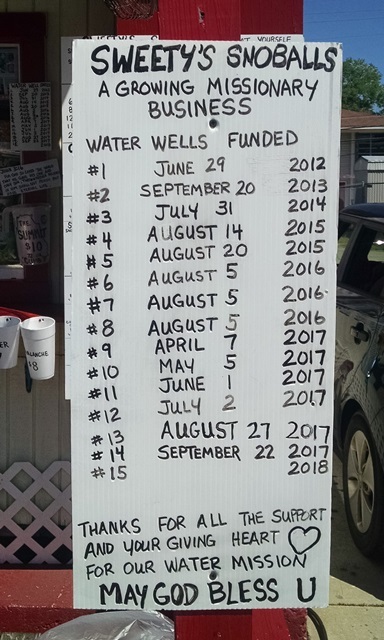 He has signs posted indicating the number of wells he and his customers have supplied since he opened in 2012. Total to date is 14 wells. We like doing business with folks like this. Oh, and the ice cream was good too. Jo and Mark told us about Sweeties last week. Thanks! 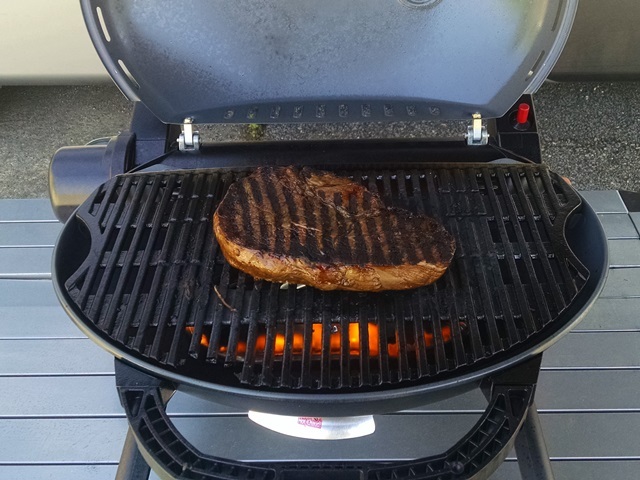 After having our dessert first, we then went home and Max tried out our new grill again and grilled us a very nice steak. We realized we had never logged a geocache in Louisiana so Max looked on the geocaching.com map and discovered the closest one was across the street in the YMCA parking lot. So he walked across and found it. 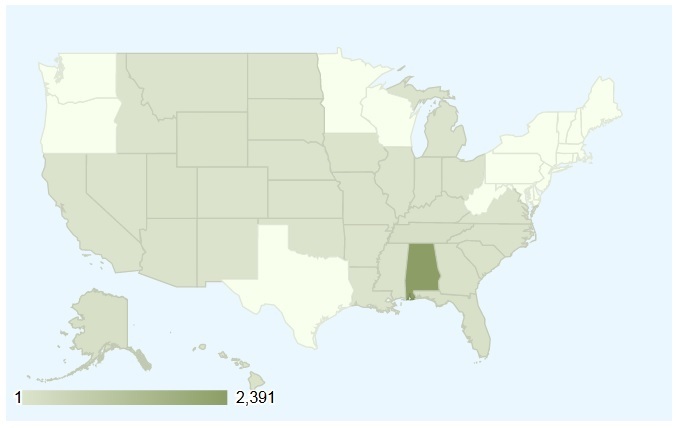 We now have geocache finds in 33 states. 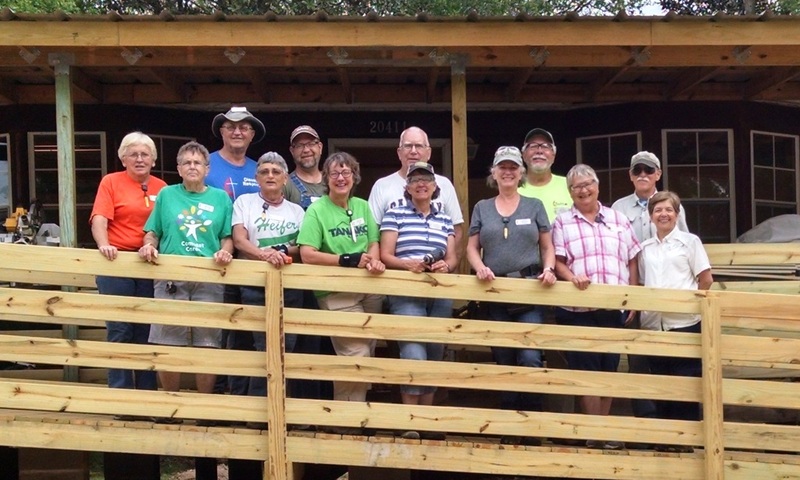 It was a quiet day, with good times spent with church members and team members and team members puppies. We got our puppy fix. It was a good day. This morning we said goodbyes to Dave and Rita, around 7:00 and then Jo and Mark around 10:00. We will certainly miss both couples. They have both become dear friends and were certainly hard working members of this team. Safe travels to you both and we hope to see and work with you again soon. If not before then hopefully we will see you in September at annual meeting. In between departures, Max prepared another wonderful breakfast. Love mornings when he has time to relax and prepare a wonderful breakfast. Later in the morning Anne and Suzanne did a little more painting at the church. 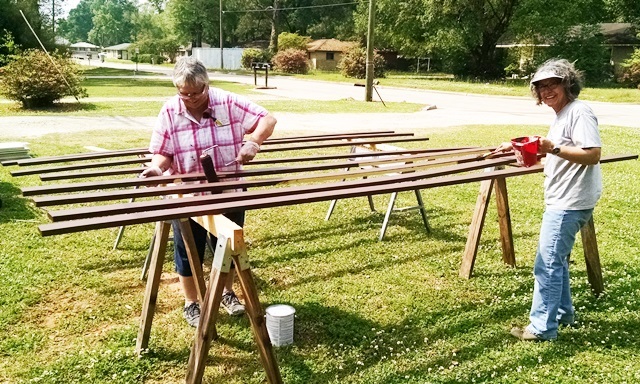 They want the doors to look good for Easter. After that we relaxed most of the day, did the laundry and then went to Rice and Roux again for dinner. Anne tried the shrimp fettuccine this time although it was actually penne pasta. It was good but still think the chicken and sausage gumbo and fried fish is the best. We had the red beans for the first time and they were quite good. That’s about it for today. Hope you all have a wonderful weekend celebrating our risen Savior. The forecasts were at least partially correct. It rained today. And rained and rained and rained. Fortunately we had no severe weather and by 5:00 this afternoon we had beautiful blue skies and a gorgeous sunset. Early this morning we started watching the weather closely. We decided to postpone devotions until 8:00 because the rain was suppose to be really bad about that time and we didn’t want people out driving in the storm. Rita brought us a devotion about Maundy Thursday. Thanks so much Rita for a really good devotion. We decided to not go out to Baker to Richard’s because we have primarily outside work there. The predictions were for thunderstorms and possible tornadoes. We didn’t need to be trying to work outside. There was work to be done at the church. 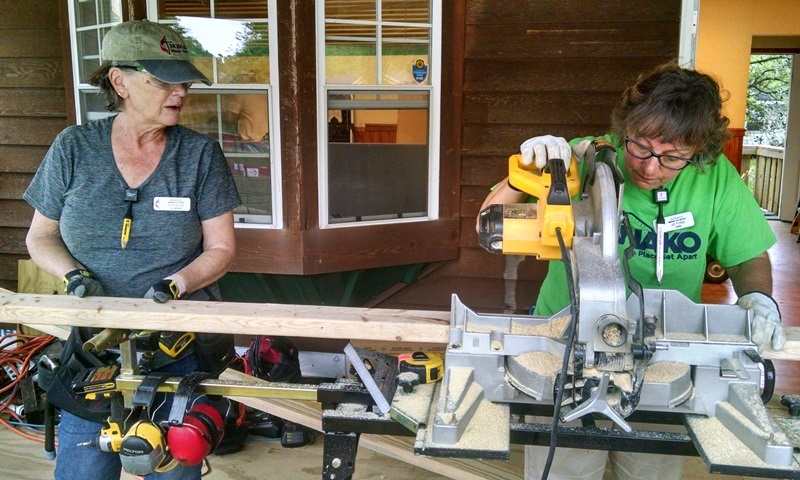 The original plan was to work a few hours at the church, watch the weather and then perhaps we could go to Baker or out to one of the other homes that need inside work after the threat of severe weather had passed. Everyone got started at the church and found their spot they wanted to work. 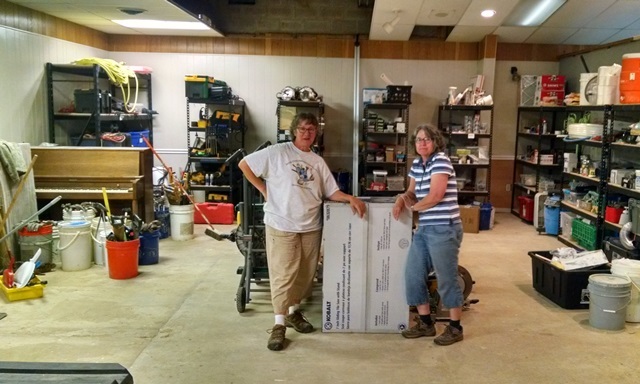 Mark, Barrie, Lee Ann and Jo began working in the tool room to clean it up and organize it. Max also did some work there. Wow. 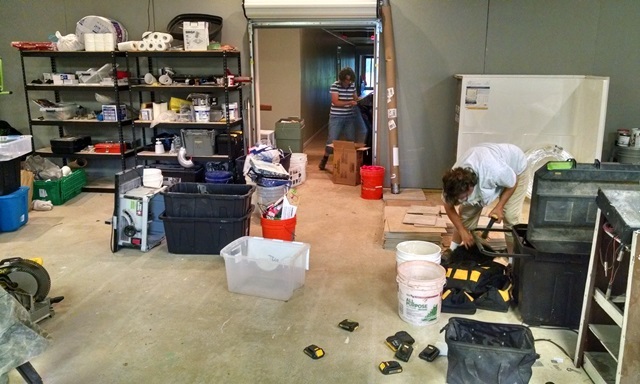 The tool room now looks amazing and we can find what we need. We still have to take some things out to the paint shed but didn’t want to do that in the rain. 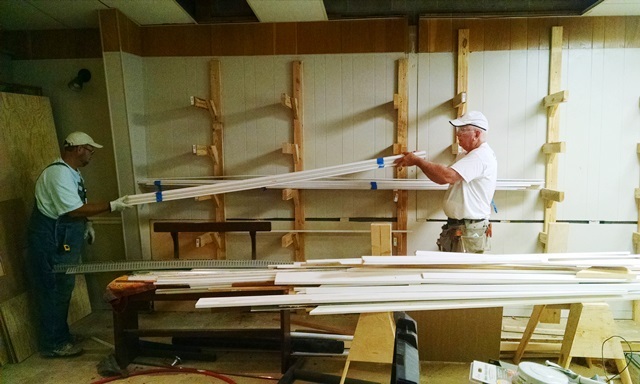 Dave installed and repaired trim in the church. The trim now looks much better. Stel stained the new trim and helped with some painting. 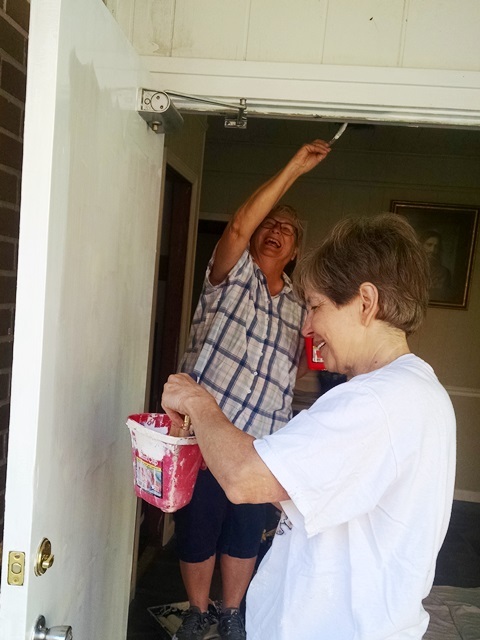 Rita worked on prepping and painting the front door of the church and Suzanne painted trim in the church. 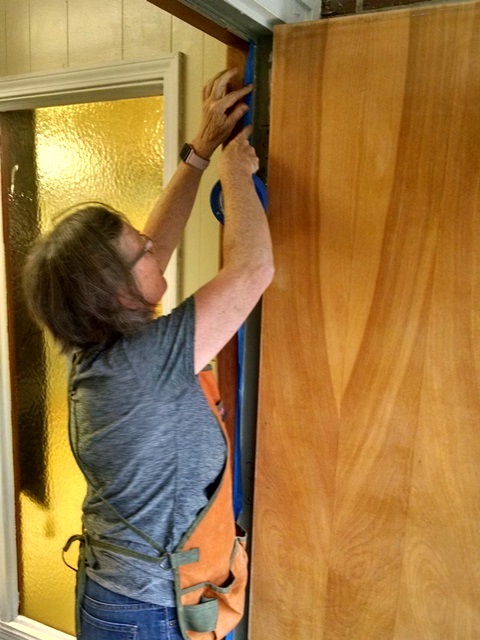 Jodi painted the doors on the dormitory. A fresh coat of paint makes everything look better. 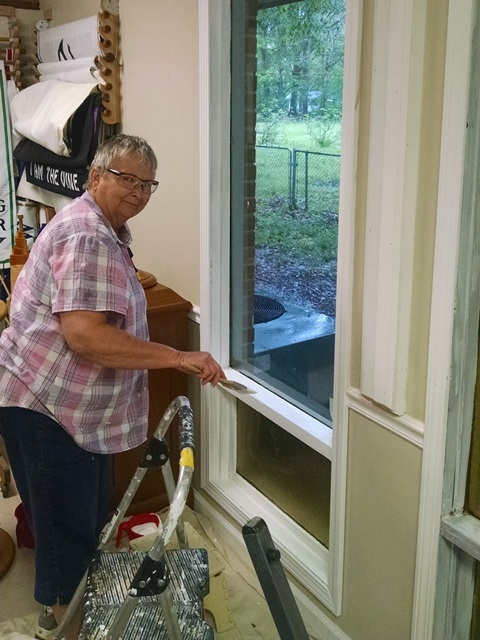 Anne did some window repairs and tried to keep everyone in the necessary supplies. 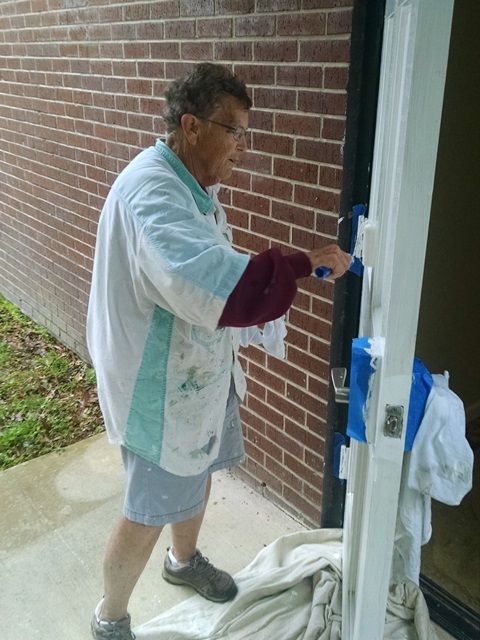 We all enjoyed the slower pace in a cooler environment and really wanted to make the church look a little better before Easter. It’s our little gift to the people of Francis Asbury. They have been so nice and welcoming to us that it was nice to be able to do something for them. Shortly after lunch we said goodbye to Avis and Gary. 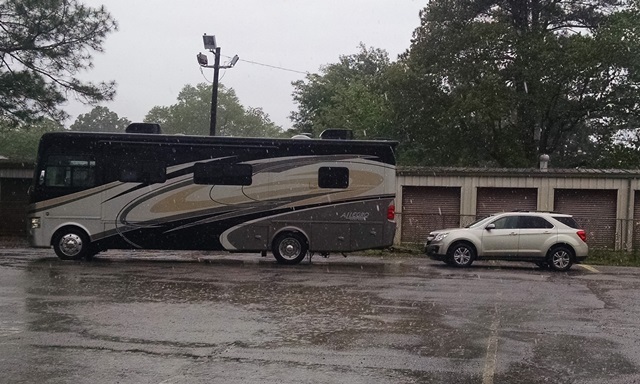 They had been watching the weather and based on forecasts for their destination, decided it was time for them to hit the road. We enjoyed working with them so much. They were a tremendous asset to this team and we will miss them. Prayers for safe travel and that they can get Gary’s knee surgery taken care of quickly so they can get back to work soon. We decided to just stay at the church for the day and continued the various projects after lunch. We were pleased with what we got done but there is more to do. 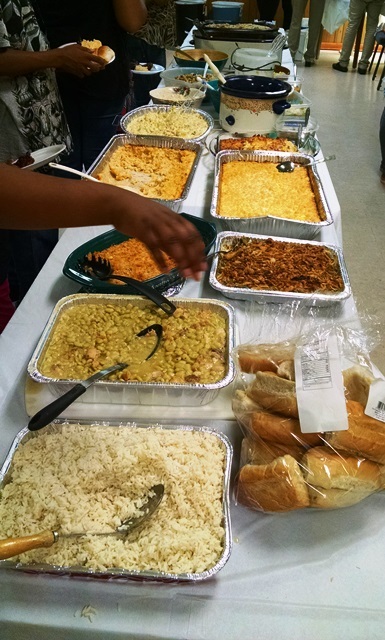 Tonight we again decided to have our Thursday night dinner at the church. 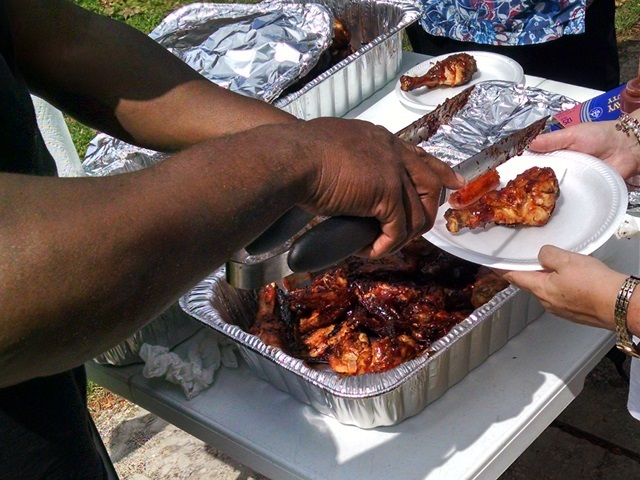 We had a lot of chicken and veggies left over from the Sunday dinner, along with many desserts. So we ate leftovers. They were just as good as they were Sunday. Jo and Mark will be leaving tomorrow, as will Dave and Rita. We ate, enjoyed dessert and talked and laughed like we have for three weeks. We didn’t say goodbye yet because we plan to see them before they leave tomorrow. Today was a mostly cloudy day but boy when the sun was out it was hot and humid. We were thankful for the overcast skies. We had a couple of tiny showers. 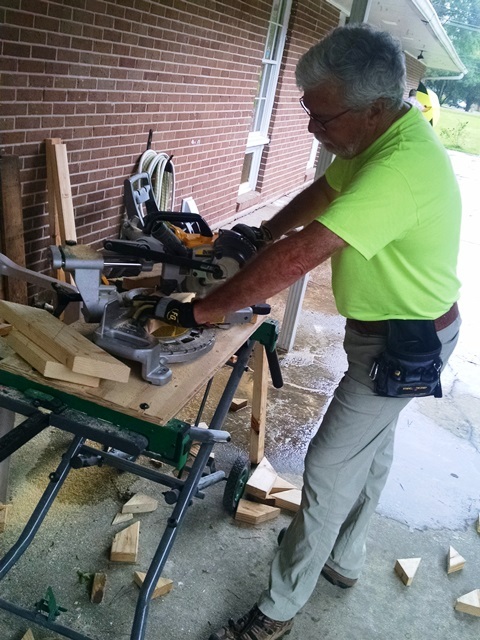 It was just enough to make us cover up the chop saw once but by the time it was covered the rain had stopped. Today devotions were led by Stel and Jodi who again did a great job. They shared the history and significance of the folded napkin found in the empty tomb. We then headed to the job sites. 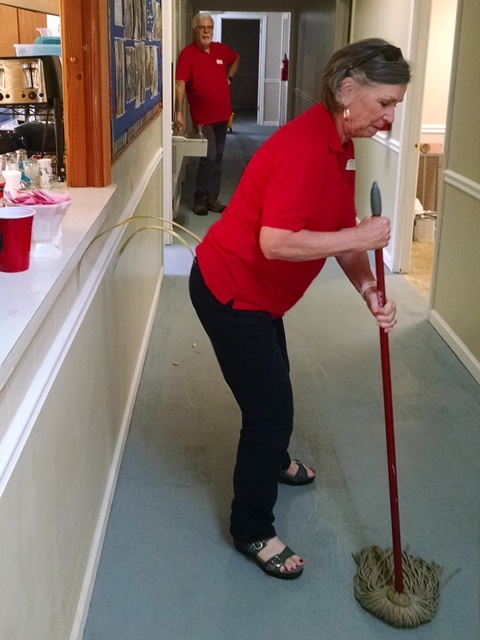 Again today, Jo and Mark went to the Denham Springs house to repair the bathroom floor. 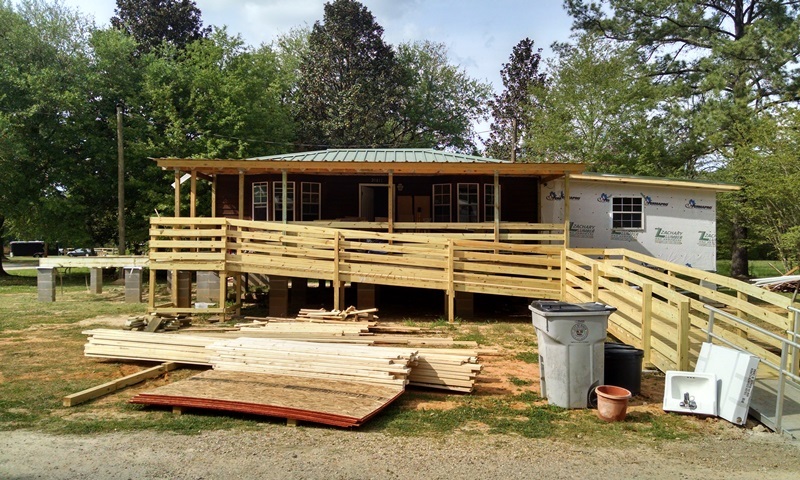 They got that completed this afternoon and tomorrow we plan for them to be back working on the framing at Richard’s house. Yea! We missed them. 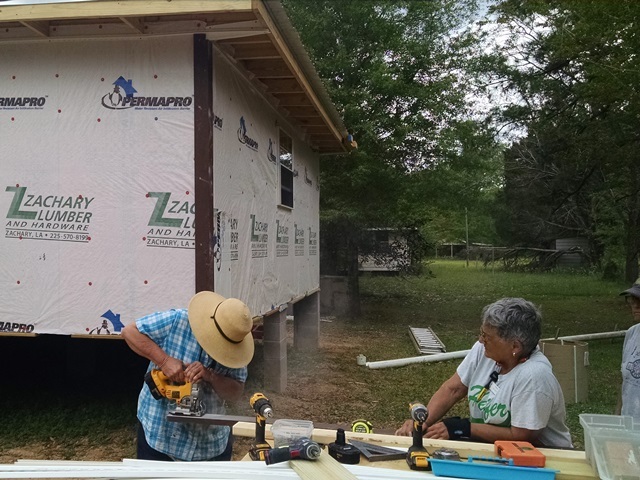 We may need to go back to that house later this week or next to set the bath tub, toilet and do some drywall work but we need everyone at Richard’s tomorrow while we hope to have dry weather. We shall see. At Richard’s we made good progress. 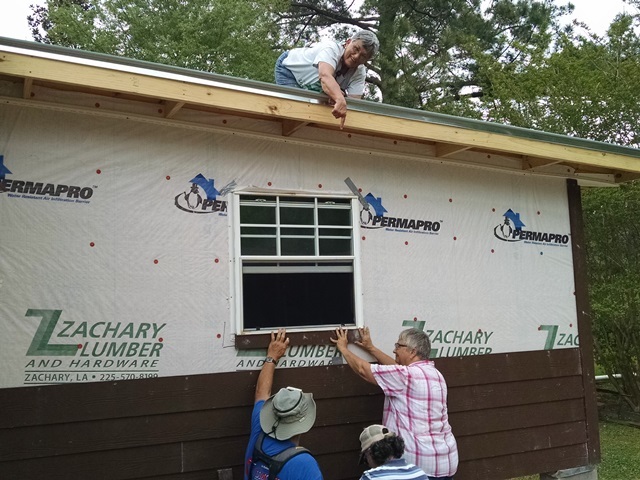 Suzanne and Lee Ann completed the painting of the siding for the first addition and put up the first couple of pieces. It’s going to look good. And they got to use a new tool that none of the rest of us have tried yet. It’s for cutting the concrete board siding. 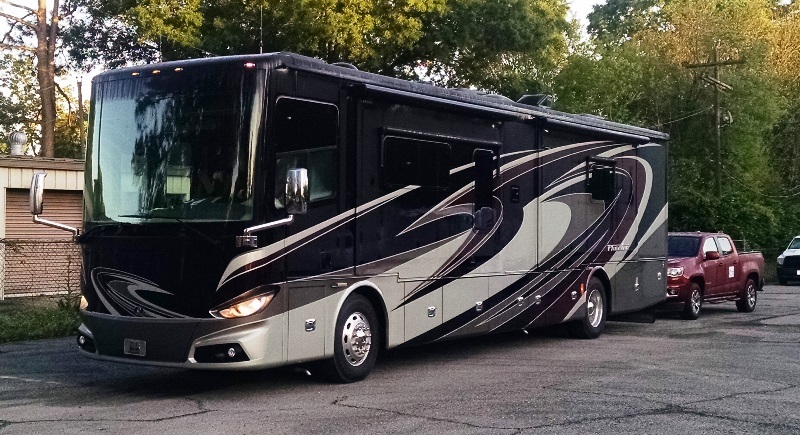 From what I hear, we may have a purchase in our future. 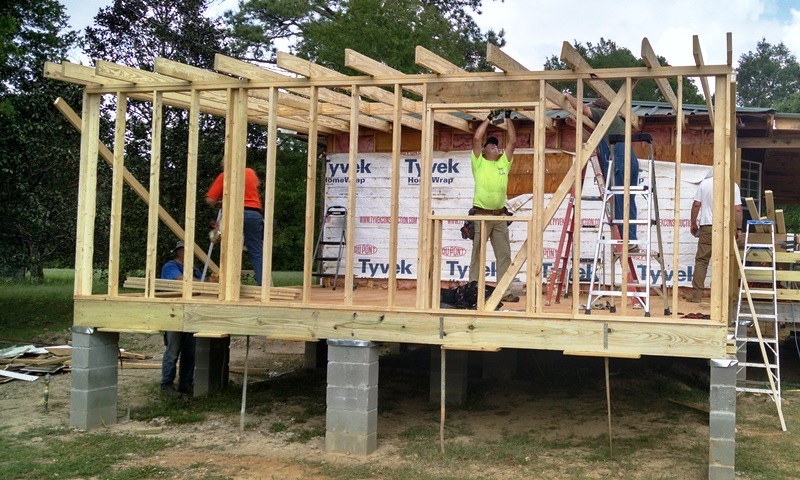 The framing of the second bedroom addition moved ahead today. We started on the decking this morning and finished that in time for a slightly late lunch. 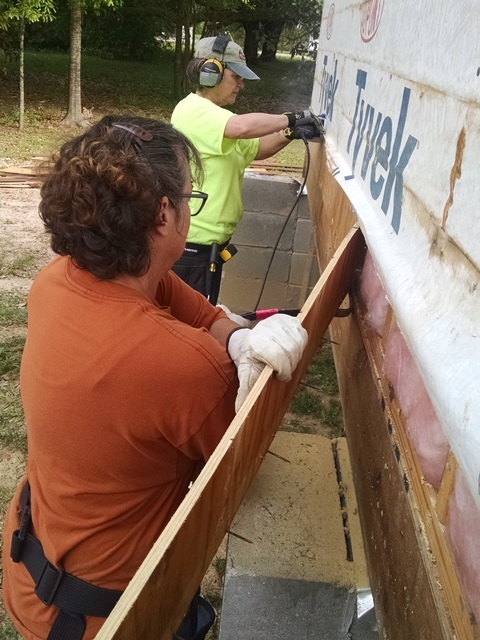 We then removed the remainder of the siding and part of the sheathing in preparation for starting the rafters. The window air conditioner was removed as that is where the door into the bedroom will be. 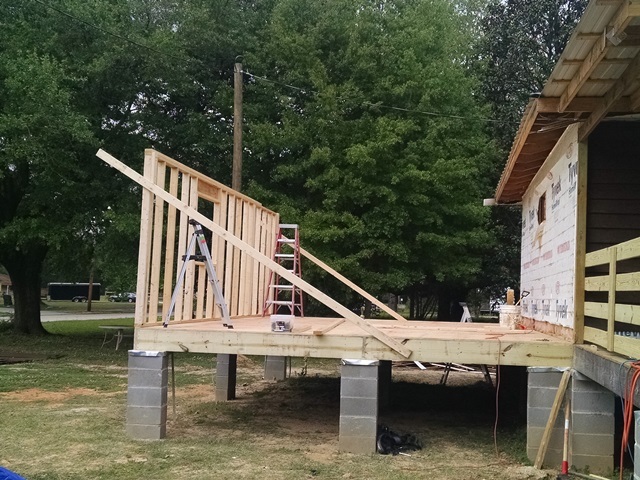 We also raised one wall of the addition and began the layout of another. We are pleased with all that was accomplished today. 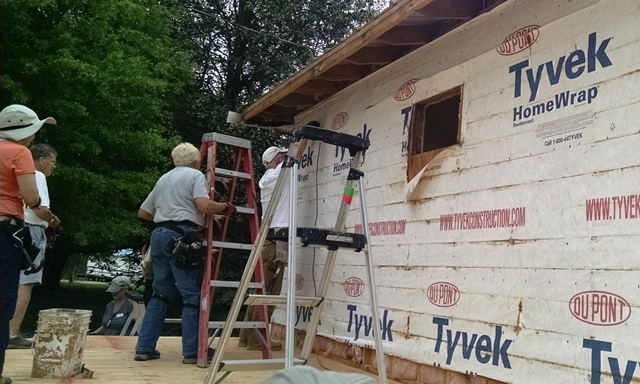 This addition is moving faster because we learned a lot on the first bedroom and bath. Before we left we covered all our lumber in case it rains tonight. 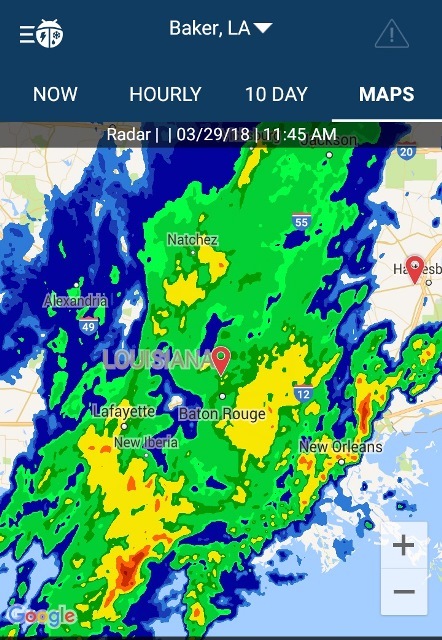 A front is going to come through and it’s looking like Thursday will be a rain day, but we are hoping for at least a good half day of outside work tomorrow. We were all pretty tired tonight but still had enough energy to meet after showers for left over pie from Sunday’s dinner and a brief card game. This team really knows how to work and play and laugh. 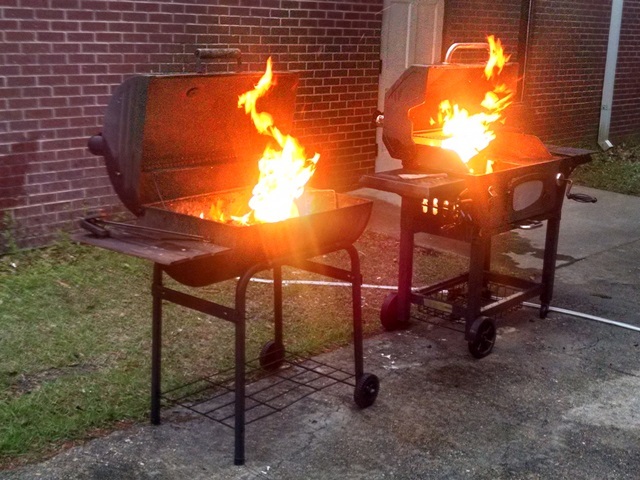 Today was another nice but hot day in Baton Rouge. It was cloudy at times but there was a lot of sunshine too. After devotions by us at 7:30, we all again headed out to Baker, LA, to Richard’s house. 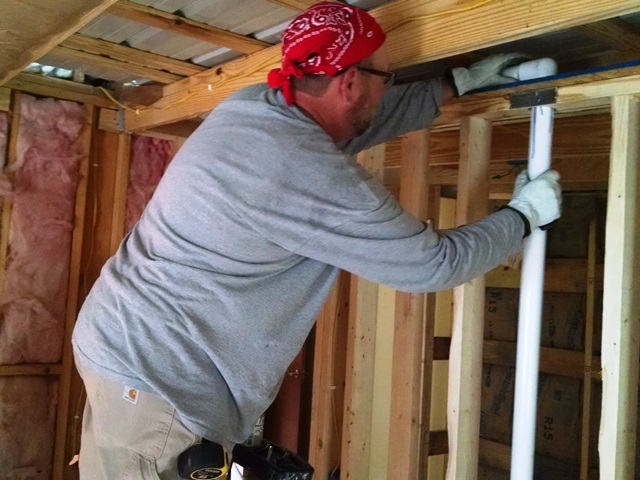 The first part of the day we all worked on getting the second bedroom addition started under Gary’s direction. It got of to a pretty fast start but then we were out of materials and worked on some other things. 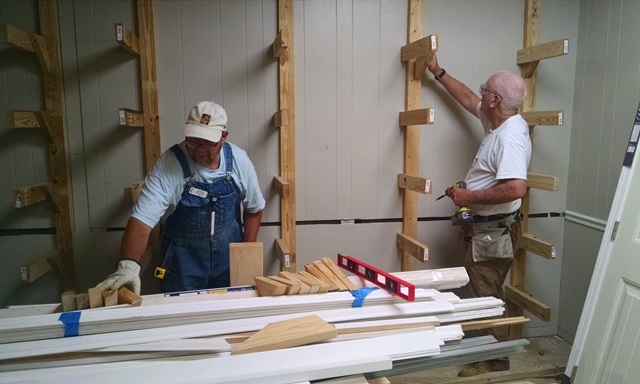 It began with removal of the siding and sheathing and cutting studs and corner posts for the wall. The best part of the morning was Stel was able to get the smoke detector rough wiring done and the electrical inspector came by and approved our electrical rough-in. 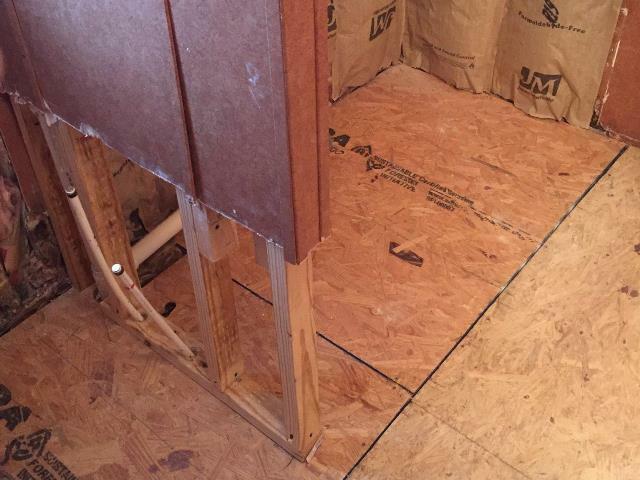 Now we can complete the installation of the insulation and start the drywall in bedroom #1. 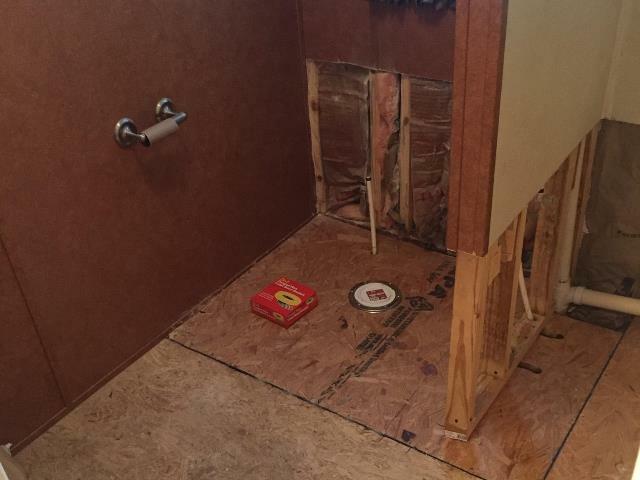 Mark also got part of the plumbing done this morning. 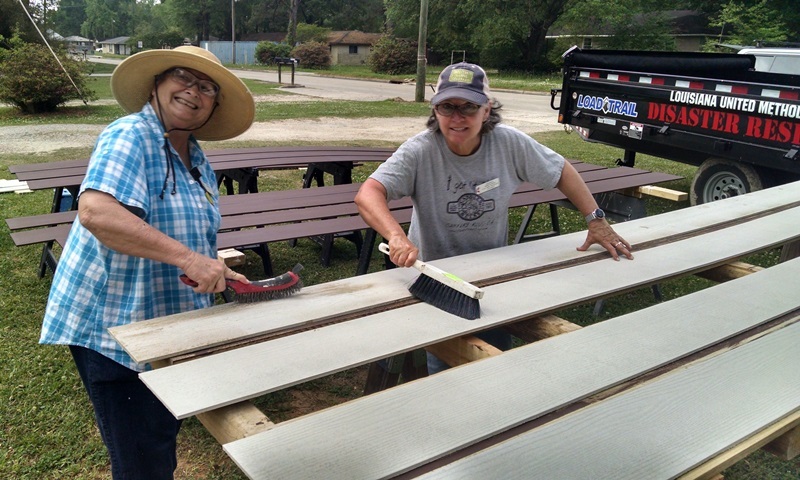 While all that was going on, Suzanne and Lee Ann worked on getting the first coat of paint on the siding. The siding is looking good, but of course it will need another coat of paint after installation. When the materials arrived it was full speed ahead on the second addition. 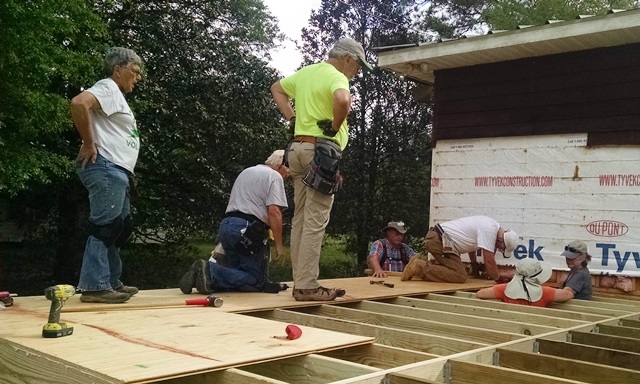 There was lots accomplished and by the end of the day all the floor joists were installed. In between all that there was drywall to unload and two loads of lumber. 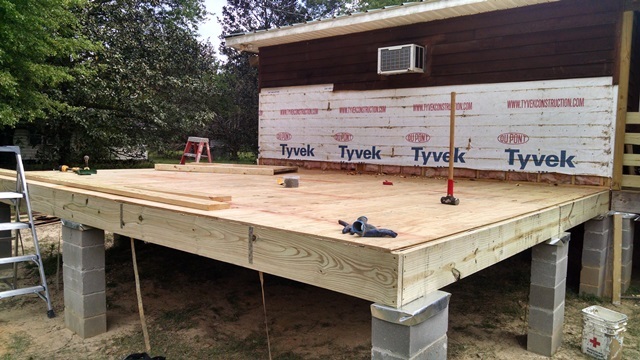 Of course, the next pieces of lumber, the floor decking, were on the bottom of the last load. 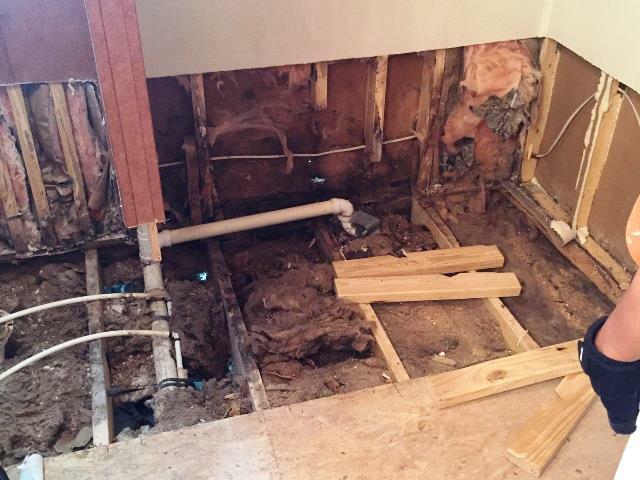 This afternoon Mark and Jo went to another house to do an “emergency” repair of the bathroom floor. 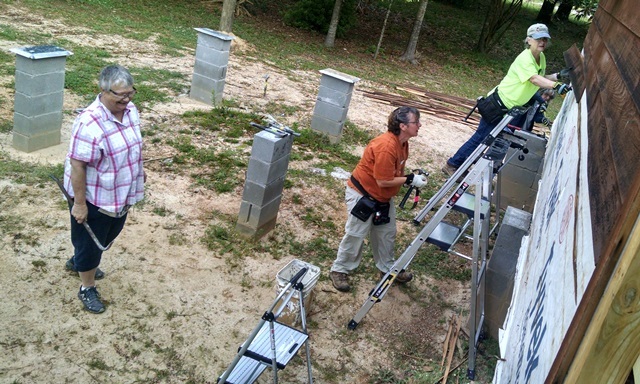 The report we received was that there was a small hole that needed repair to keep the bugs out and to make it safe. When they arrived it was a much larger situation. They got started on the repair this afternoon but that quick little project is going to turn into a multi-day project. Much was accomplished today but there is a lot more we want to get done this week before we loose three couples at the end of the week. We were all tired tonight but suspect we will be tired every night this week. We will see what tomorrow brings. Today started early for us since the pastor asked us help prepare for the joint service today. 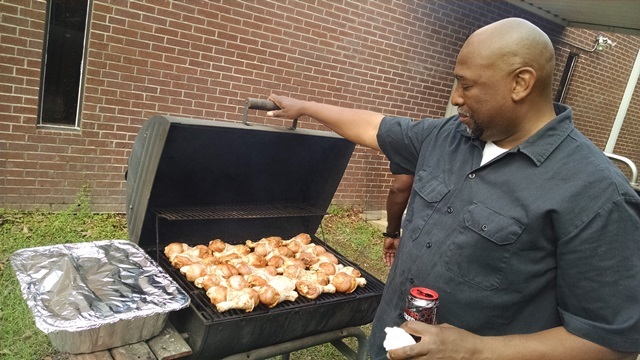 We started setting up tables and unloading grills at 7:00 and continued from there. There were tables to wash, table covers, tents to set up, many chairs to take to the tents, assistance in the kitchen, bathrooms to clean and meeting many nice people. Before we knew it it was time for the service. 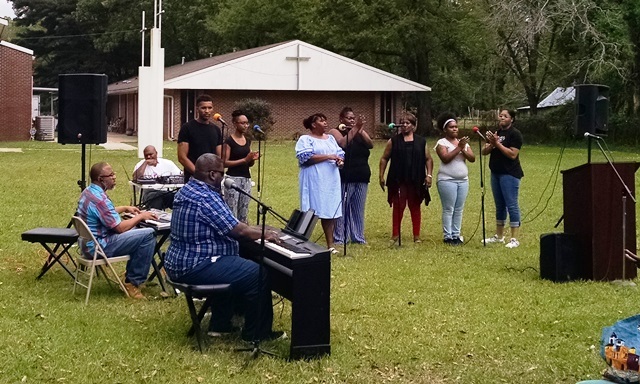 The choir and pastor from Preserve Life Church, across the street, led the service today. It was a lively, spirit filled, Palm Sunday service. It did our hearts good to see the two neighboring churches worshiping together. After the service we all had dinner together. It was wonderful. 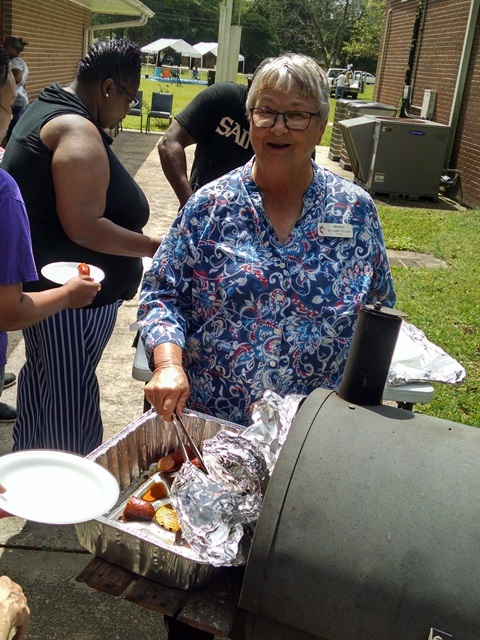 Some of the men of the Preserve Life Church grilled chicken and sausage and then there were all the traditional sides plus some not so traditional (at least for Alabama) sides and they were all wonderful. We ran out of room on the dessert table there were so many. We couldn’t begin to try them all but what we had was wonderful. After dinner the NOMADS stayed to help clean up and then it was nap time. Tonight we found the church left us a lot of food in the refrigerator for us to enjoy this week. Yep, it’s a 5-10 pound project. We had team meeting at 6:00 tonight and got to know our new team members a little better. There was so much laughing. Sometimes we wonder if there is a serious bone in any of us. Sure is good to really laugh. Have a good week.